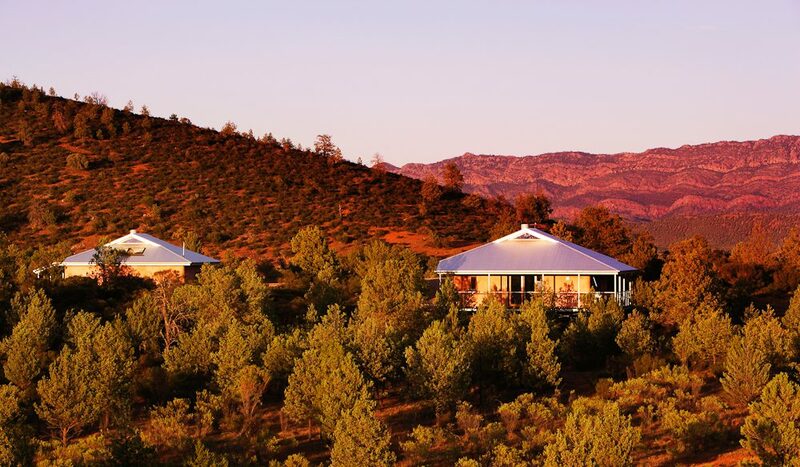 Rawnsley Park Station's deliciously secluded eco villas, Flinders Ranges, outback South Australia. Who says hiking in outback environs like the Flinders Ranges means you have to rough it? Steve Madgwick finds country-style pampering and sound eco philosophies at this working South Australian sheep station. Your eyes grow heavy as you stare up at the Milky Way, drifting off to sleep after five hours’ outback walking. You don’t want the billion-star lightshow to end, but you don’t want the sun to wake you up too early either. Simple solution: press the remote-control button that mechanically, but quietly, brings covers sliding across the dual skylights located directly above your comfy bed. 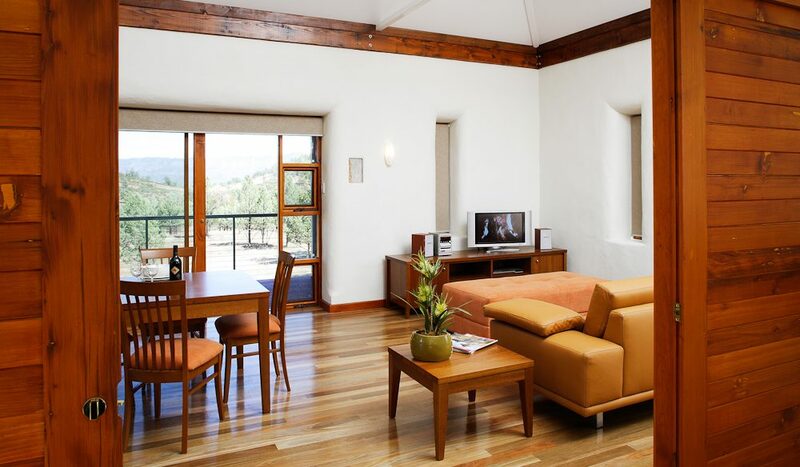 Rawnsley Park Station’s self-contained Eco Villas are a compelling attraction for walkers who want a taste of the outback well cushioned by bucolic pampering. This functioning sheep station, which dates from around 1851, lies 430 kilometres north of Adelaide and has ‘only’ 2000 sheep grazing on its 30,000 acres – small change compared with nearby properties. 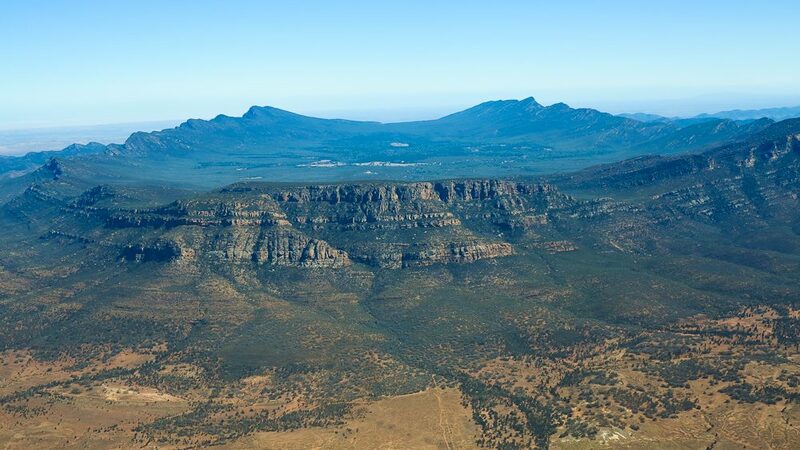 Rawnsley’s aspect to the immediate north is dominated by the amphitheatre of mountains known as Wilpena Pound – a dramatic, eery scene that taunts you to gaze at it and challenges you to explore it. The station’s guides offer three- to five-day guided walks through and beyond the dress circle of foothills. These walking programs are tailored to your desires from a number of individual day walks, which means that, at the end of each day, you are driven back to your comfortable digs to regroup and regale. 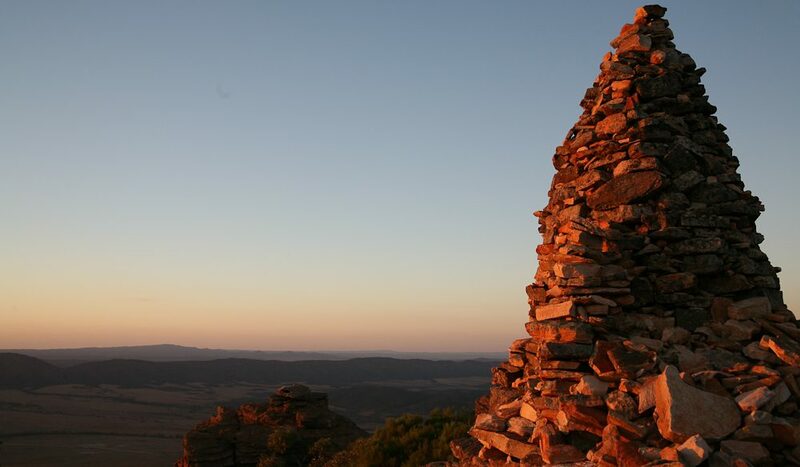 The ‘local’ walk choices vary from the easy Twidale Top (two kilometres; 45 minutes) to the ‘difficult’ Rawnsley Bluff (12 kilometres; five hours), but your guides (Tony, Kym and Volker) will gladly suggest paths almost anywhere in the Flinders. On day one Tony, owner of Rawnsley Park, guides me on one of his favourite trails, the Blinman Pools Walk, which begins around an 80-kilometre drive north of the station. The trail meanders through a trickling rocky creek and up a cavernous gorge that has funnelled the fallout of millions of years of outback storms. Euro kangaroos nonchalantly bounce away as you rock-hop and walk the five-hour journey. 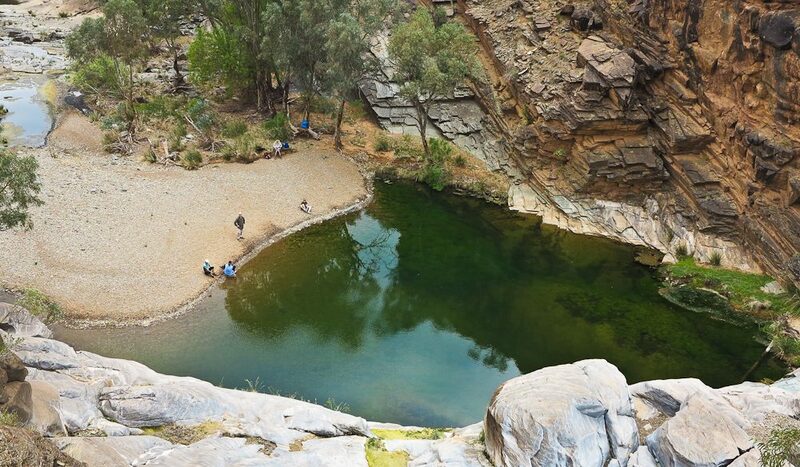 Sheer maroon-brown cliffs provide shade from the outback sun, and the creek’s water is not just potable, it’s wonderfully refreshing, with just a trace of mineral aftertaste. When we reach them, the pools are not at their brimming best, but are blanketed by watercress so fresh and peppery I want to stuff my backpack full of it. That’s no problem, since I’m only carrying essentials: sunscreen and a packed lunch provided by the station kitchen. Along the path, Tony puts on his ‘eco-farmer’ hat, weeding out a few prickly pear plants and noting the healthy-looking feral goats. Before returning to Rawnsley, we call in at the 145-year-old Blinman Hotel and chat with locals about the goats and water levels. For lunch and dinner (post-nanna nap, perhaps?) The Woolshed Restaurant serves modern-country fusion with enough choice to keep the fussy unfussed (although the dessert menu could have a little more variety). This evening, out of respect for my hiking buddies of earlier in the day, I forego the marinated kangaroo in favour of roast pork belly with sloe gin jus. 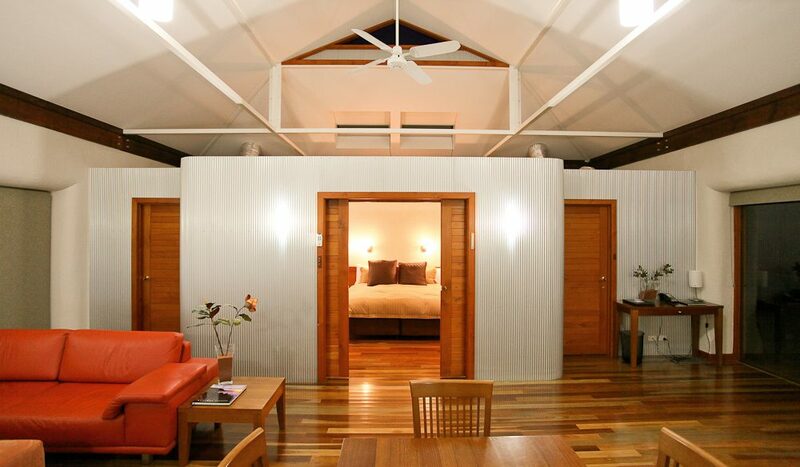 You can also order meals in your eco villa, or cook your own ‘barbecue pack’ on the villa’s generous-sized balcony. The choice of walks from this luxuriously rustic base depends on your energy, fitness and motivation. Perhaps the most rewarding but also the most challenging route scales Rawnsley Bluff, up the southern face of Wilpena Pound. If you’re not a morning person, it’s a hard sell. The guides sheepishly suggest a 4:30am (yes am) start, to allow you to take in the day’s first rays. Negotiating the fairly steep, rocky gradient demands your full (head-torched) attention, and boots soled for serious hiking – about one-third of the trail is relatively hard going. Worth it? 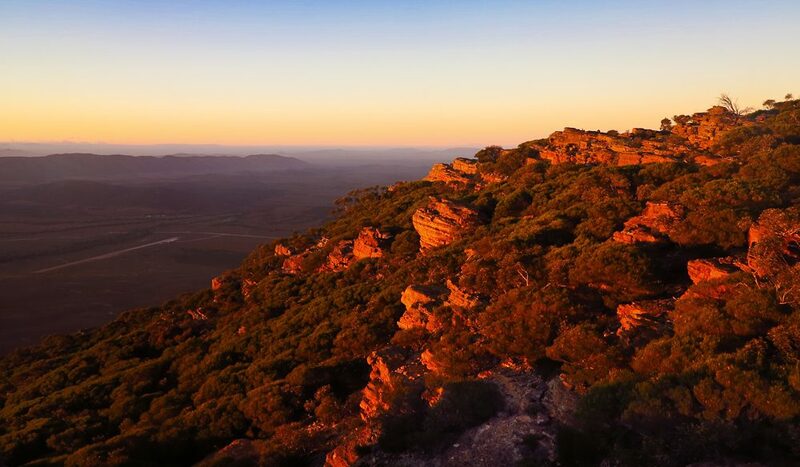 The views from the 943-metre bluff looking down into Wilpena have to be among the most splendid vistas of accessible outback around, especially when the rising sun’s pink and orange hues work their magic. Another big pay-off for your early start is a hearty outdoor bush barbecue breakfast, served at a shady bush-slate table. Back home, the property’s eight eco villas (holiday units and camping sites are also available) are a sound compromise between elegant comfort and true green credentials. 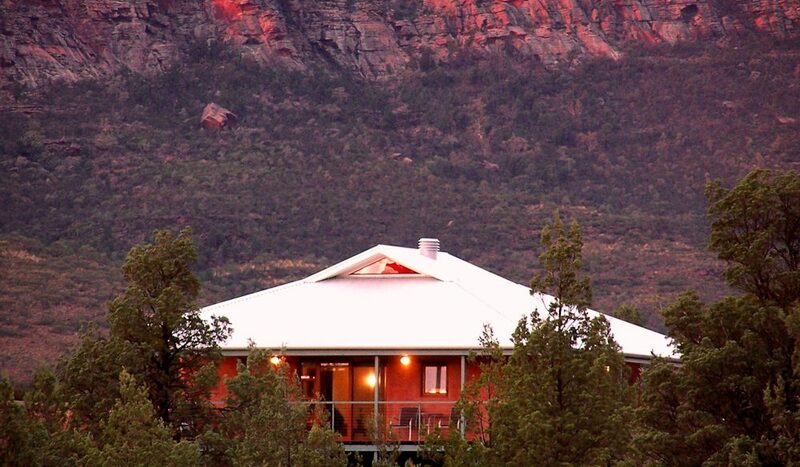 Built on a secluded wooded ridge, most face the sublime oxidised sandstone cliffs of Wilpena or its adjacent range. Solar-generated power covers two-thirds of the station’s energy needs (though not if you’re constantly using the air-con) and ‘thermal efficiency’ is aided by straw-bail insulation and double glazing. Drinking water is pure rain. And food scraps go to the chooks that provide breakfast eggs with sunrise-coloured yolks. The villas’ fit-out is dominated by lacquered, richly hued, recycled Oregon timber – one villa incorporates the rustic beam from an old Adelaide Show. Modern understated kitchens provide convenience and flexibility of meal choices. The light terracotta colour of the building exteriors is congruent with the surroundings as viewed at sunrise and sunset. Curved render, inside and out, and the use of narrowly corrugated iron is Adelaide architect Paul Downtown’s nod to traditional Flinders’ cottages. In fact, the villas exemplify the Rawnsley Park Station offering: an outback-country blend of past and present pastoralists’ lives – rusty farm implements, rustic cottages, and Kev the Kelpie – alongside a diverse, delightfully accessible outback ecosystem of sweeping vistas, spinifex, mallee scrub, circling wedge-tailed eagles and the odd pair of sprinting emus. Getting there: Rawnsley Park Station is a 4.5-hour drive (430 kilometres) from Adelaide. Costs: The three-night package from $1535 per person, twin-share; five-night package from $1975 per person, twin-share. Packages include all meals, guided walks and accommodation in an eco villa. Need to know: Guided walks run in April, June, September and October.